Wear your VASA membership with pride. Exclusively available to VASA members! Stock is strictly limited! Email support@vasa.org.au to reserve your shirt. 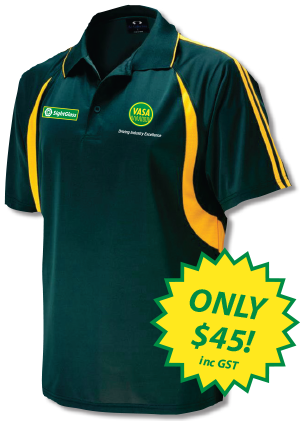 These VASA branded shirts are made from snag-resistant Biz Cool 100% breathable fabric. The logos are embroidered, with SightGlass and VASA emblems on the front, plus the Driving Industry Excellence slogan and VASA wave form on the back (see lower pic). Perfect for wearing while in the workshop or during VASA events such as Wire & Gas or SightGlass Training. Available sizes: S, M, L, XL, XXL, XXXL (limited availability of of S, XXL and XXXL).